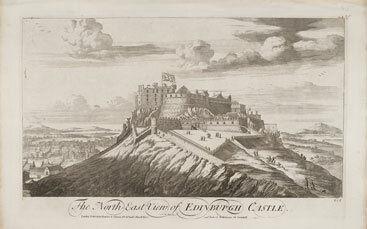 With the Scottish variant of the Union Flag flying high and figures strolling on the esplanade, Edinburgh Castle dominates the city. This prospect shows a fortified area which doesn't feature in Slezer's drawing of 1675. The buildings on the left are in Portsburgh, a suburb outside the city walls. This view was not included in the first edition of Theatrum Scotiae.